Special Containment Procedures: SCP-978 is to be kept in security locker H-J-12 at Site 17, and only to be removed or handled by personnel with Level-2 security clearance or higher. Testing parties may request extra film and printing paper at their leisure. SCP-978 is not to be used for blackmail, entertainment, or personal reasons. All photographs produced by SCP-978 are to be cataloged along with full testing description. Requests to destroy photographs may be processed by Level-4 security clearance or higher personnel, at the discretion of the testing party. 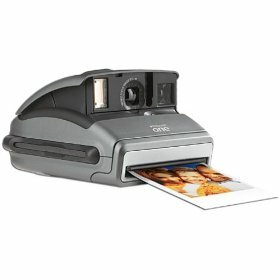 Description: SCP-978 appears to be a standard chrome-and-black Polaroid One instant camera, with no distinctive identifying marks or damage. SCP-978 operates the same as a standard camera, and shows no anomalous behavior beyond the photographs it produces. When a subject is pictured with SCP-978, the photograph that develops shows not what the subject was doing at the time of the photo, but rather what the subject wanted to be doing. This effect appears to be, for the most part, random, sometimes showing drastic changes and deeply suppressed desires, or simple changes and alterations to the subject or their surroundings. SCP-978 appears to be capable of expressing the desires of both humans and other creatures (see testing log) and appears to convey the simplest desires the easiest. Should two subjects with contrasting desires both be photographed together, the subjects' desires appear to 'mix' (see testing log for additional information). Simple study of basic research team. Photographed Activity: Smiling for the camera, neutral pose. Photo Result: Subject is shown looking much more tired and unprofessional, drinking from a flask. Photo Result: Subject is shown in casual clothes, as if heading out for the night. Subject admits that she wishes to go home. Photo Result: [DATA EXPUNGED] - Research Assistant ███ ██████ is placed on temporary psychiatric leave. Photo Result: Subject is shown wearing a different tie. Photo Result: [DATA EXPUNGED] - Dr. ████████ expresses extreme embarrassment and apologies for this. Testing to see effects of SCP-978 on nonhumans. Subject: Several standard white lab mice. Photographed Activity: All mice are in plain glass tank for photographing. Photo Result: All mice pictured as eating, mating, or both. Subject: Single zebra finch, standard lab animal. Photographed Activity: Sitting in cage, observing photographer. Photo Result: An open cage, with the zebra finch flying off the edge of the photo, only a wing and part of the tail visible. Subject: Standard white lab rabbit. Photographed Activity: Sitting in plain glass tank for photographing. Photo Result: Subject is pictured mating with another rabbit. Subject: Guard dog (Doberman mix) and handler. Photographed Activity: Guard dog and handler both posing strictly for photograph. Photo Result: Subjects are pictured as playing a game of fetch. Photographed Activity: Cockroaches placed in glass tank for photograph. Photographed Activity: Clinging to the ceiling. Dr. █████ admits that the picture was taken as a last-minute thought when she walked past the spider on her way to SCP-978's containment locker. Photo Result: A massive, hallways-encompassing web with a small spider in it.